This is the third studio album from Swedish quintet Agusa and the first with flautist Jenny Puertas as a full member after her previous guest appearances. Although based in Malmo, the band take their name from a small settlement across on the Eastern side of the peninsula which the original line up used as a retreat to jam and explore ideas for this classic progressive rock project. Despite several personnel changes since the band's formation in 2013, the core founder members Mikael Odesjo (guitar) and Tobias Pettersen (bass) remain very much in the driving seat. Does the eponymous choice of title suggest a return to first principles, then, or a rebirth? Only the band truly know the answer, and certainly if nothing else it suggests an immersion in landscape and the culture which is shaped by it. To this listener, however this album represents not so much a turning back, as a statement of growing confidence and assuredness. The five instrumental pieces presented here resonate deeply with bucolic imagery; mystical forces are suggested, rubbing alongside brash intrusions from a modern cityscape. The opener Landet Langesen, features Puertas' flute up front and centre, possessed, lyrical with a hint of nostalgia and an understated martial drum beat striking a note of defiance and pride, a joyous, urgent jam, resolves into a triumphant rousing finale. In the urgent Sorgenfri, darting flute lines duel with Jonas Berge's organ and Odesjo's rock guitar, competing for supremacy to suggest the chaotic diversity of the urban street scenes. Folk roots are in evidence too, in Den Fortrollade Skogen and Sagor Fran Saaris; frenzied dances insinuate themselves into bluesy rock, vibrant guitars and swirling keyboards. This is an album of multiple shades and moods; highly melodic themes are superseded by dissonant, squalling guitar (and yes, the occasional hint of Shaft! ), uplifting anthems plunge into the dark of the subconscious, powerful ensemble playing turns into raucous, psychedelic wig-outs and sublime pastoral interludes. Breathtaking. Literally so. At the end, the relentlessly driving Bortom Hemom can only conclude with a gasp from Puertas partly triumphant, partly in relief - her lungs must have been burning to keep playing with such intensity. In that final moment, we are reminded of the physical aspect of the act of artistic creation. Agusa have not merely indulged in an intellectual exercise, but committed themselves fully to the enterprise to the point of exhaustion. But don't let me leave you thinking that this is a hard listen; complex, beautiful and diverse it can be, but as Ovid noted “Ars celat Artem” (to paraphrase - “The trick is to make it seem easy.”) This is what Agusa achieve with some style. 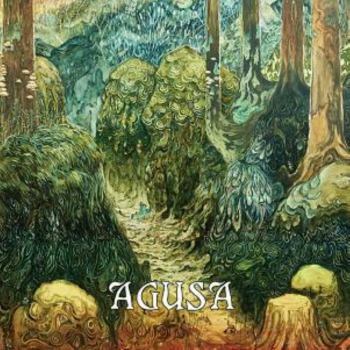 Although mostly to be heard live within Scandinavia, Agusa have made the occasional foray into wider Europe. No dates are currently available for 2018, but I do hope someone is going to invest in following up this wonderfully original collection to bring this band to the wider audience they richly deserve. If only national radio would invest in supporting such talent! The vibe is spreading, I wish the band well for the coming year. Even if the original keyboard player Jonas Berge (featured on this album) having left the band after this album was recorded.